“A square is born: Face-lift at S.F. 's most historic plaza has everything feeling like good old days,” burbled the Chronicle. As for me… Well, I’m biased. I liked the old Union Square. It was shabby, yes, but honest. Frequented by a cross-section of San Franciscans as well as out-of-town visitors, it showed us as we are. It’s one thing to put on one’s best face for company. It’s another to put up a false front. The lie is bound to out. And when it does, reality seems all the harsher. As a reminder of the way we were, I offer these observations, written five years ago, when the present megalomania had only just begun. The photos were taken today. San Francisco's Powers-That-Be have decided that Union Square needs spiffing up. To this end, the PTB – in this case, the city government, a number of design organizations, and Macy's – put together an international competition to solicit ideas, with the winner to be announced on July 28. (This is a behind-closed-doors operation. The proposals were to have gone on public display in the windows of the former Emporium store on Market Street, but it turned out that Macy's needed the space to promote a pre-season sale. Meanwhile, the empty windows of the old I. Magnin store on Union Square remain enigmatically shrouded in white paper.) The sponsors have nothing to lose: even the $10,000 prize was amply covered by the 1,073 aspirants who paid $20 apiece to enter. The project has yet to receive funding, but the group undoubtedly took encouragement from the success of the Simon/DeBartolo Group in promoting its Field of Dreams. 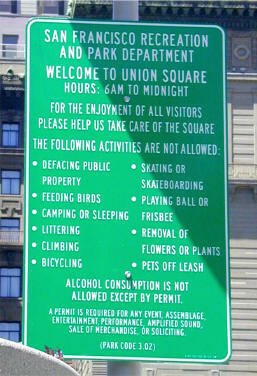 Despite San Francisco's long-held reputation for valuing the voice of labor, Union Square actually acquired its name from a different constituency. During the Civil War, ideological battles were fought in the streets of the city in the form of rowdy torchlight parades and other, more destructive disruptions. The space bordered by Powell, Geary, Post, and Stockton Streets provided an ideal venue for bonfires and orations as civic leaders used mass meetings to further their powerful and profitable alliance with the federal government. If, as the historian Howard Zinn argues, the War Between the States culminated in a victory for Northern-style capitalism, then the square's variegated past suggests that it is indeed aptly named. The space was there before the name. In 1850, when Mayor John White Geary donated the land to the city for a park, it seemed very distant from the center of things in Portsmouth Plaza. Geary, who dabbled in real estate as well as politics, had the notion that beautifying the area would increase the value of the surrounding property, which he owned. The lure of politics may have overcome his business instincts, however, because he didn't actually stick around long enough to give his plan a chance. Geary became governor of Kansas in 1856-57, effectively but briefly binding a tourniquet around the bleeding territory. By the end of his life in 1873, he had moved still further east, to serve as governor of Pennsylvania. The space took on a spirit of its own, one congruent with its entrepreneurial conception. During the summer of 1864 it rocked to the sound of hammers as the Mechanics' Institute erected a huge pavilion to house the fourth industrial fair it had hosted in a decade. The structure occupied most of the block: flag-topped towers marked the outermost edges, and four redwood-covered wings intersected beneath a dome rising more than one hundred feet. Fair-goers like Mark Twain flocked enthusiastically to see "pomological, ichthyological, mechanical, and a general variety of specimens" that included a miniature Labyrinth Garden and an equally small Skating Pond (complete with skaters in full motion) as well as a two-ton chunk of cheese. The exposition was partly a charitable fund-raiser: people contributed 25 cents to the U.S. Sanitary Commission (a forerunner of the American Red Cross) to see the cheese and a 200-pound silver brick from Nevada, which lay inside a flower-covered pagoda surrounded by a circle of jetting water. But it was primarily a self-congratulatory showcase for the region's extraordinary commercial and technological advances, stimulated by four years of mining discoveries and wartime demands. Perhaps reflecting the peculiarly Victorian penchant for combining religious and technological success, San Francisco's most prominent protestant churches congregated around the square in the late nineteenth century. But they, and the way of thinking they represented, soon became irrelevant and vanished. The century concluded with celebrations of the splendid little Spanish-American War, in which the United States protected its extensive investments in Cuba and became a major colonial power by acquiring the territories formerly ruled by Spain. 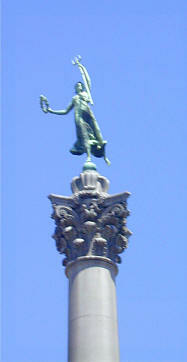 In 1901 President William McKinley presented the city with the twentieth-century equivalent of a golden spike, a link to the new global economy, when he broke ground in the middle of Union Square for a monument – a 97-foot granite column surmounted by a bronze figure of Victory – in honor of Commodore George Dewey's defeat of Spanish forces at Manila Bay. After the earthquake in 1906, the monument stood tall amid the rubble. The recently constructed Hotel St. Francis, in majestic ruins nearby, was rebuilt within a year. And one by one, elegant department stores gathered where the churches had stood. In 1942 the surface of the square was ripped off and replaced as the landscaped roof to a four-level underground parking garage (the first of its kind in the country). The city's habit of marrying technology and commerce continued, for the garage offered valet parking, allowing shoppers to walk directly from their last stop of the day to their waiting vehicle. 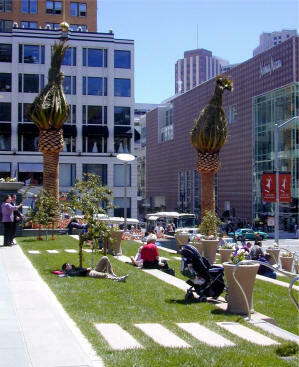 In those days, according to WPA chroniclers, Union Square represented "to an international clientele and to San Franciscans the city's traditional demand for quality." Even in the mid-1960s, Chronicle writer James Benét noted that it was the spot where "the city earns its world-wide reputation for handsome dress." And now? The St. Francis remains. So does the monument, its luster dulled by generations of roosting pigeons and Filipino objections to the Eurocentric inscription. The department stores are retrenching and regrouping as suburban malls and catalogue shopping change retail patterns. The square itself has grown dingy. In a city with a high tolerance for trash, its level of litter is relatively low, but the pavement and walls are embedded with substances better not investigated too deeply, and even the floor of the automatic, self-cleaning J.C. DeCaux toilet would benefit from a good scrubbing. Grime and all, the area gets a lot of use. On a recent afternoon when the cold summer fog was numbing tourists' knees, the benches and lawns were filled: well-dressed office workers, shivering foreign visitors, and shabby street people talked, ate their lunch, or simply took a rest. At noon on a sunny day when a band is playing, it's standing room only. But the San Francisco Prize Coalition is right – we need a new design. Macy's and Company is trying desperately to revive the old role of the square as a commercial catalyst. Instead of authorizing a Union Square Theme Park – a sanitized haven for hordes of happy consumers – it would be far more realistic, and far more fun, to redesign the space in explicit recognition of its present uses. Capitalize, if you will, on the wonderfully varied population that has long been part of San Francisco's attraction. Keep the square simple, as befits its position between Downtown and the Tenderloin. Keep it clean, as befits a city with pride in itself. Fill it with flowers, as befits an oasis in the middle of a concrete wasteland. Make it friendly: remove the "No Loitering" signs. Make it quieter: restrict traffic to Powell Street and the existing one-lane route to and from the garage. Invite the people of San Francisco, on a series of weekends, to sweep and polish and plant, making this space truly their own. And then, echoing the five-day bash that marked the rebirth of earthquake-ravaged Market Street in 1909, have the happiest house-warming party imaginable.